Proxima Centauri, the closest star to the Earth (only 4.28 light-years away) is getting a lot of attention these days. It hosts a planet, Proxima Cen b, whose mass is about 1.3 Earth-mass (though it could be larger, depending on the angle at which we are viewing it). Moreover, Proxima Cen b orbits the star in its habitable zone. Proxima Cen itself is an M-dwarf star with a mass only about one-tenth the Sun's mass and a luminosity about one-thousandths of the Sun's; because the star is dim, the planet's habitable zone is twenty times closer to the star than the Earth's is to the Sun, and the planet orbits in 11.3 days. M dwarfs are the most abundant type of stars, and their small radii make them easier targets (relatively speaking) to spot transiting exoplanet signatures. 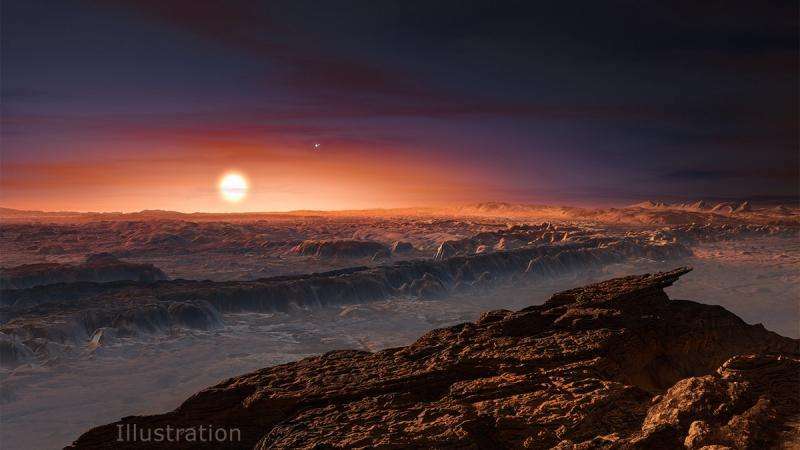 Recent statistical estimates have concluded that half of M dwarf stars probably host an exoplanet between about 0.5–1.4 Earth-radii orbiting in or near their "habitable zone." Proxima Cen and its exoplanet, therefore, are important benchmark objects for understanding low-mass stars, their planets, and the planetary environments. M dwarf stars pose a particular hazard to their planets: A large proportion of their radiation, much more than in Sun-like stars, is in the form of UV, extreme UV, and X-rays. This radiation can evaporate a planet's atmosphere, especially when those planets orbit nearby in the habitable zone. Indeed, the question astronomers ask is whether planets like Proxima Cen b can retain any atmosphere at all, at least over a long enough time for the planet to be "habitable" from any practical point-of-view. An addition danger is posed by the star's magnetic activity, which is not only responsible for the corrosive radiation but which also drives stellar winds and coronal mass ejections that could be even more perilous to atmospheric survival. The photoevaporation of planetary atmospheres due to stellar radiation has been studied in limited situations, but not much effort has been devoted to the case of active M-dwarf stars and their magnetic activity. CfA astronomers Cecilia Garraffo, Jeremy Drake and Ofer Cohen have begun a program to model the stellar winds and magnetic field for active M-dwarf stars, and to investigate the impact on the atmospheres of planets in habitable zones. Proxima Cen is their first specific example. They found that the pressure of the stellar wind at the exoplanet was a thousand to ten thousand times higher than the solar wind pressure at Earth. Moreover, the pressure is highly nonuniform, and Proxima b will pass through these extreme pressure variations twice each orbit leading to the compression and expansion of its atmosphere by factors of up to 3 every day. The atmosphere of Proxima Cen b is also likely to experience supersonic wind conditions. All these phenomena will have a significant negative effect on any atmosphere that might exist on Proxima b. The extent to which similar hostile conditions prevail on other M-dwarf exoplanets is a subject of further studies. More information: "The Space Weather of Proxima Centauri b," C. Garraffo, J. J. Drake, and O. Cohen, ApJL 833, L4, 2016. What if the planet has a strong magnetic field? Even with the strong solar wind, I'm pretty sure this planet would have at least a heavy CO2 atmosphere. This star is actually a small red dwarf (and a 'flare star'). So the yellow sun-like color in the artist rendition shouldn't be thought of as realistic. But the conclusions about the pressure of solar wind being so high are of great significance since it means few or no planets near such stars should be expected to be habitable in the ways we think aided the start of life on Earth or it's continued survival. Proxima b appears to host space mobile sentient life. They also appear to be amphibians. The back side is heavily iced over, and living "under the ice" seems to work for them. They are ~8.5 feet tall bipeds with multiple hearts. They are somewhat similar to the alien species who have been reported to have a base in Antarctica for quite some time. They have interacted with humans for ~4300 years or more.